I wondered about this since the beginning of March if people would be able to buy Xenoblade without having to Preorder. I already preordered the game, but I’m just curious since since Nintendo’s lack of faith in the game selling made it seem like one of those preorder exclusive deals. Thankfully GoNintendo had the answer, and the official word from Nintendo is that they “…can confirm the Xenoblade Chronicles will be available exclusively for purchase through U.S. Gamestop retail locations…Nintendo never stated that it will only be available to those who preorder it.” So going by their word, you don’t necessarily need to preorder to score a copy of the game. But then again, it’s best to preorder anyways to make the numbers look good ahead of time. Now The Last Story, that’s a different… err story. While you can probably get away with not pre-ordering Xenoblade and pick up on-the-spot, XSEED will be practicing the Niche Publisher Limited Run scheme that has been successful so far for publishers like NIS America, Atlus, and XSEED themselves. In other words, The Last Story will have a limited run in the U.S. and XSEED will print copies close to the number of pre-orders that they get. 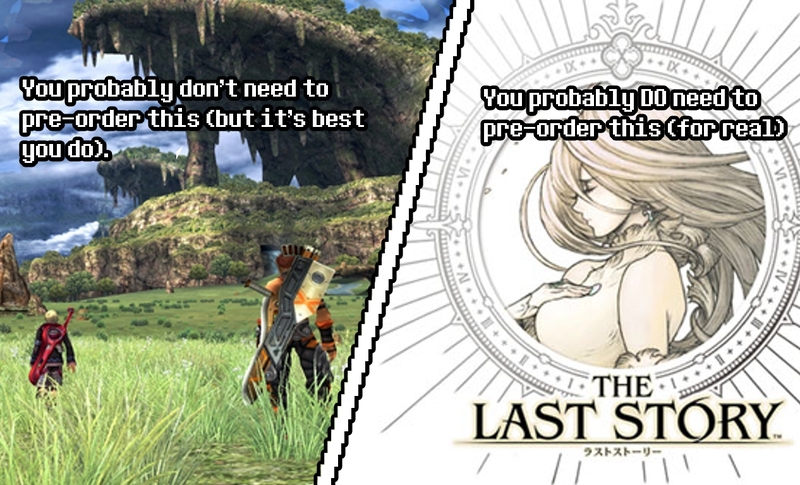 So if you want to score yourself a copy of The Last Story, you’re better off preordering. Thankfully the game will be stocked “at any retailer that wishes to stock it.” So if you hate Gamestop, you can get it at another store, like Game Champ! This entry was posted in Gaming News and tagged nintendo, operation rainfall, oprainfall, the last story, xenoblade, xenoblade chronicles, XSEED on April 3, 2012 by Steven T..